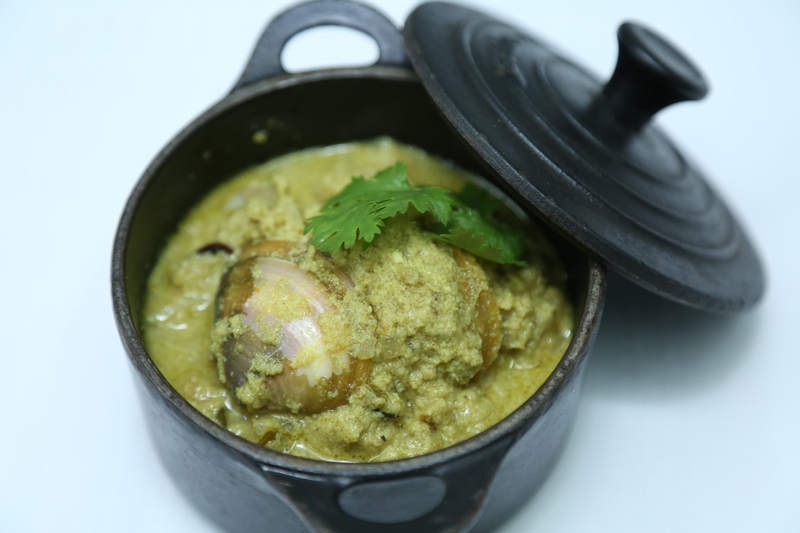 Gastronomica breaks all the norms of conventional dining. Its quirky interiors exude a feel good vibe which is bound to make your experience a joyful one. This place works equally well for families and youngsters; it strikes the perfect balance. It is classy yet funky. The moment you step inside, you get an enchanting aroma of delicious flavours emanating from the kitchen which is located quite close to the entrance; a smart move. This tactic reminded me of Tom & Jerry where the tiny rat would follow the aroma of cheese, cunningly used by Tom to trap its adversary! Yes, the irresistible whiff of food being prepared will ensnare your senses. The interiors were done up very tastefully. They have paid great attention to the smallest of details. Right from the paper napkins to the bare brick walls, everything is absolutely distinctive. To begin with, the napkins are placed on a boat shaped holder and are black in colour. It gave off a very Pirate-like feel. The plates were not round; they were cut parallelly from two sides. They had a lightning bolt symbol at the center, similar to the insignia on Harry Potter’s forehead! The glasses were cut in a slant manner from the top. It took me a while to get used to it as I was constantly in fear of the glass falling off the table! One section of the wall had ‘Cheers’ written over it in different languages. Glass bottles were embedded in the wall to make for an interesting patch of art which reminded me of a similar patch of wall at Wood Box Café on Hudson Lane. The menu is quite extensive and provides a wide array of European, Pan-Asian, Indian and Italian delicacies. They bring the whole world on your plate. From Tandoori dishes to Dimsums, Crepes to Burgers and Pastas to Nihari, it’s all here, under one roof. The Watermelon Cooler was refreshing and pulpy; a perfect start to the meal. My food journey began with Chicken Ko Thay Dimsums. The filling was quite liberal and well made. The covering was a bit sticky so I wouldn’t say they were the best but it was an okayish start to the meal. From here the ride just got better. The Alfredo Penne Pasta was outstanding. The cheese is bound to give you a foodgasm. Public etiquettes stopped me from wiping the delectable white sauce off the pan with my fingers! This is a must try. Next came the Primavera Pizza. With a super thin and crispy crust, it maintained a steady equilibrium between taste and health. While it is quite flavorsome with the bell peppers and olives, it is low on cheese. For the record, I am a cheese lover but this didn’t seem like a bad option. The pizza was brought on a huge piece of wood, shaped like a tree trunk while the pasta was served in a small pan. The veggie sliders were cute little bombs of flavor and definitely the winner of our meal. The fist sized buns held crunchy bean patties and was a blessing to the taste buds. These were served with French fries and marked the end of our feast. 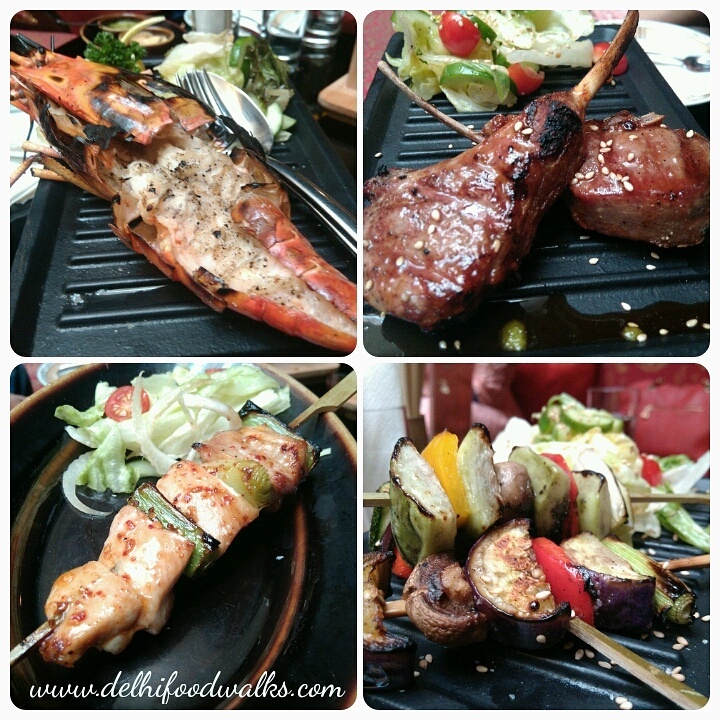 Gastronomica has managed to carve a niche for itself in the raging restaurant business of South Delhi. The staff was very attentive even though the place was packed to the gills on a busy Saturday afternoon. With some fine upholstery and interior designing, it stands out among the crowd of fast food joints like Dunkin Donuts, CCD and the likes. Reservation is recommended. Hop on an exuberant and delicious gastronomical ride @ Gastronomica! The history and origins of the delectable delight that is the rasgulla, has always been a subject for heated debates, but its existence is nothing but a divine blessing for us. And what’s more, eastern India is not the only region that can lay claim to making the best ones. New Delhi’s Connaught Place, an exuberant shopping and eating hub, has a sinful little underbelly that not everyone is aware of. Hidden among the boutiques and swanky restaurants are street stalls selling the most delectable rasgullas and other sweet treats. Sweetening the deal even further are the throwaway prices. An amiable gentleman with a kind face, Lalji has occupied his corner of Connaught Place’s H Block for close to 40 years. In the summer months, customers flock to his modest stall to cool down with rasgullas, ice cream and rabdi. Originally from Gorakhpur, Lalji lives in Nabi Karin, Paharganj, and earlier sold ice cream in Satyanarayan Katra, Chandni Chowk. Although he makes the ice cream himself, he sources the rabdi from Hathras; it is made by two brothers named Bablu and Mukesh, who also supply it to Haldiram’s, says Lalji with quiet amusement. The rasgullas at this stall are sweet and juicy, and the rabdi (Rs 10 for a cup), is sweet, textured and melts in the mouth. 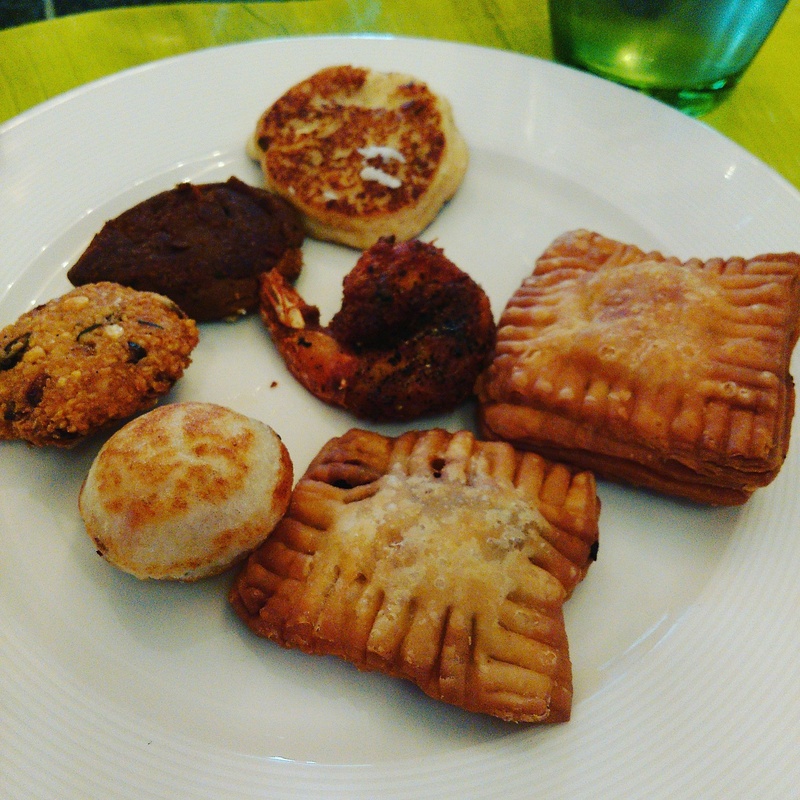 It is sold through the year, though the Lalji sets aside the ice cream and succulent rasgullas after Diwali, replacing them with gulab jamuns and gajar ka halwa. Lalji sets up his stall at noon each day and leaves at 9pm. The first thing that strikes you about Sajan Lal’s shop is the array of posters depicting benevolent colourful deities smiling down upon his trays of rasmalai, kulfi, rabdi, faluda and rasgullas. Sajan Lal is from Faizabad, Uttar Pradesh, but has been living in Delhi since 1982. Like Lalji, he too buys his rabdi from Bablu and Mukesh, but makes his rasgullas and ice cream himself. 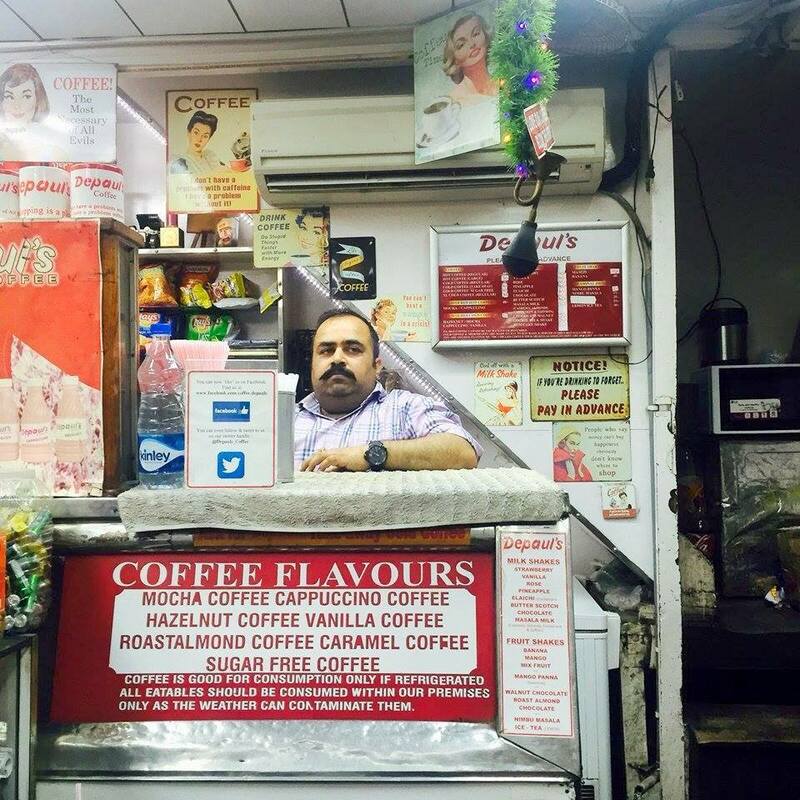 As he makes you a faluda-kulfi (swiftly going through the steps — ice cream, faluda, chashni, rabdi, ice cream again and a deft dash of Rooh Afza) he tells you that he lives in Paharganj, as do many others in his trade. The best thing he makes is the rasmalai; it is soft, flavourful and utterly beautiful to behold. Sajan Lal sets up shop at 10am, and stays till around 8.30pm, which is when his stock usually runs out. 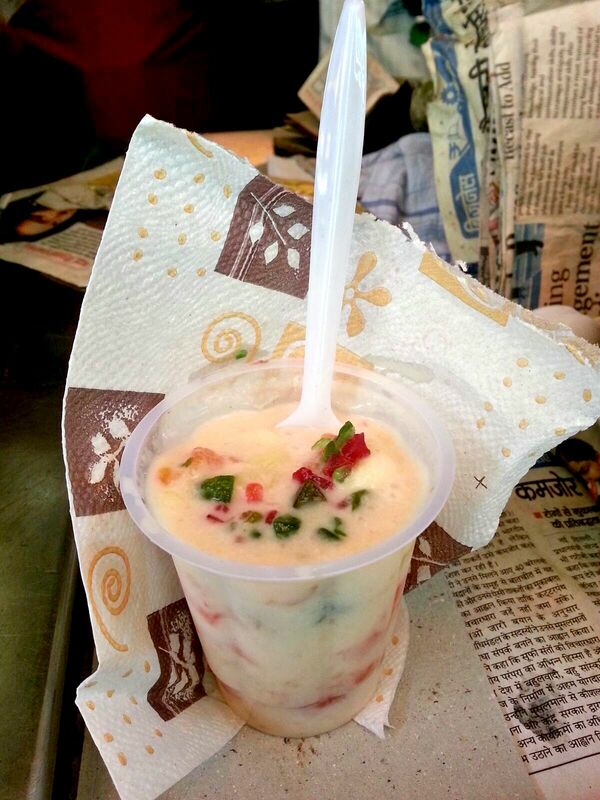 Sanjay Agarwal runs a stall near Barakhamba Road metro station, selling faluda, rabdi, kulfi and rasgullas. 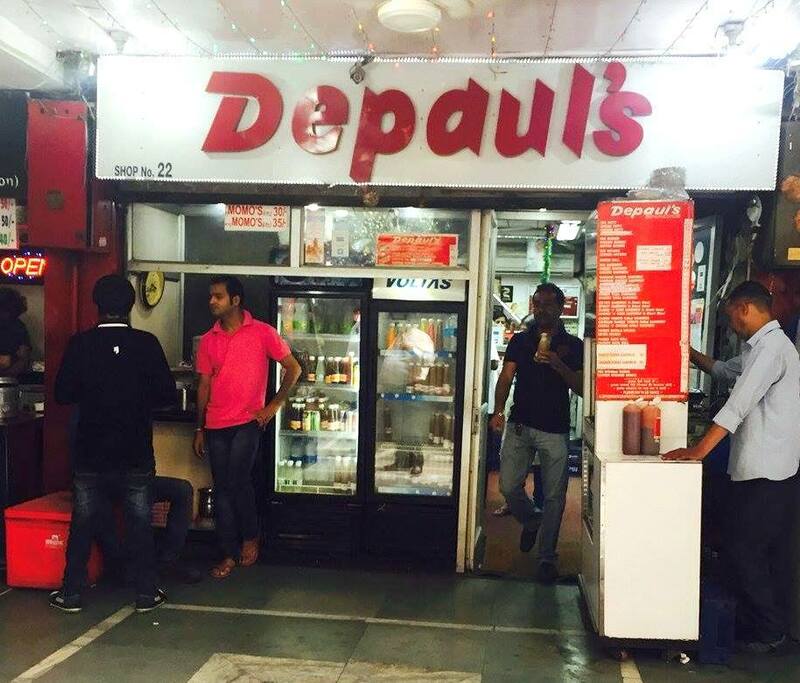 It is probably one of the most famous sweet stalls in CP, if not all of Delhi – before Sanjay hopped on board, his father had been running it for 40 years. The place is always crowded, with people asking for their favourite desserts. Unlike most other vendors, he breaks a rasgulla into half before serving it to you, and when you express surprise upon learning that he too lives in Paharganj and buys his rabdi from Bablu and Mukesh, he tells you that this is no coincidence. Lalji is his brother-in-law and Sajan Lal is his father’s younger brother. In shop number 53, Shankar Market, sits Rampher, Lalji’s brother. 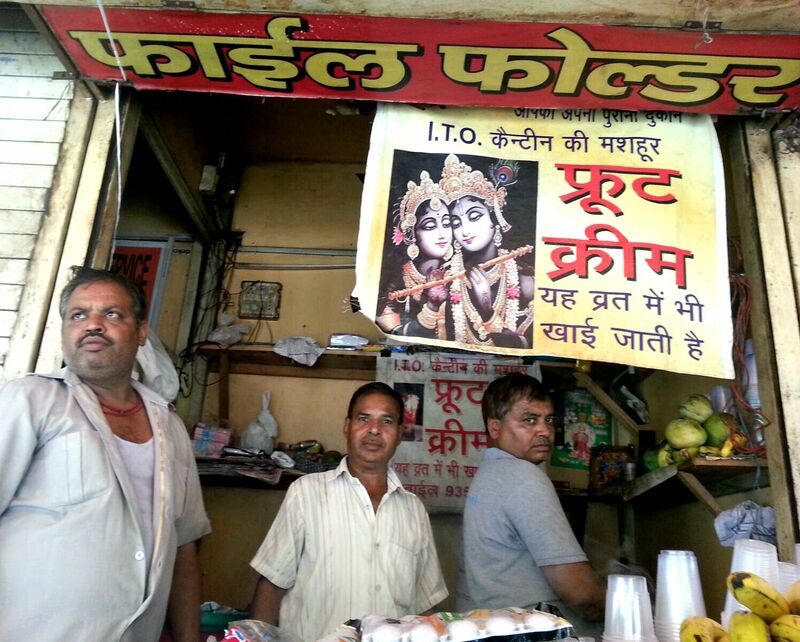 He only sells faluda kulfi, says Sanjay Agarwal. Agarwal’s most legendary dish is the slightly tangy faluda; he explains that while the others use only mango ice cream, they use mango and vanilla. He also explains that their ice cream is the best because they churn the milk more. In the winter months, they sell moong dal ka halwa. Pizza Express hosted a blogger’s night, to celebrate its 50th anniversary and the launch of its new menu, at its recently opened outlet at Ambience Mall, Gurgaon. Established in 1965 in London, by founder Peter Boizot for the love of real Italian pizza, Pizza Express has mapped its journey with over 500 restaurants in 14 countries across the globe. Every outlet is uniquely designed, with its inspiration drawn from the location of the outlet. 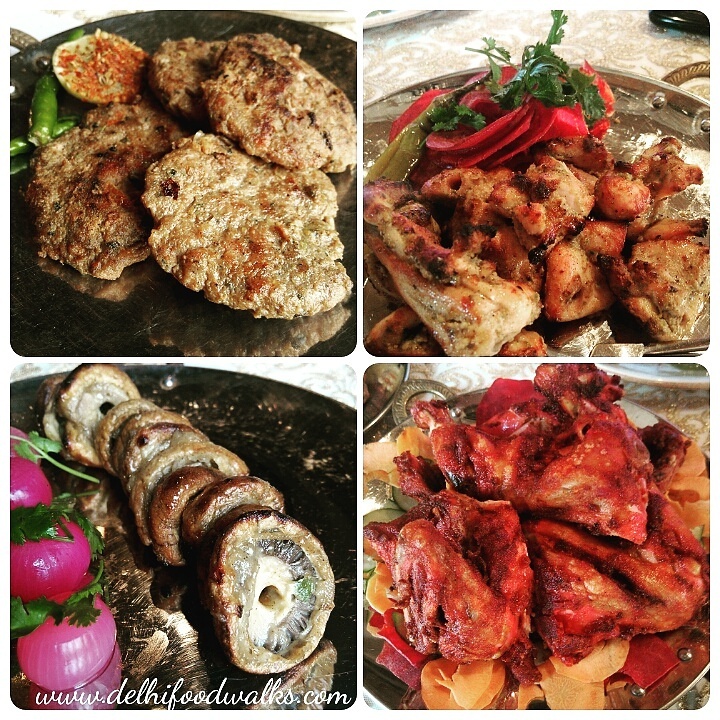 A warm welcome and an assorted non vegetarian platter marked the start of the evening. Antipasto Pollo e Gamberro – an assortment with pesto marinated chicken, prawns on skewers, roasted tomatoes, fresh buffalo mozzarella served with basil pesto, pesto rosso and dough sticks baked with emilgrana (a dehydrated hard cheese). Each item on this platter complimented each other, as explained by the chef the buffalo mozzarella cleanses the palate so as to ensure that we can enjoy the individual flavours of each assortment. Also we were served a drink which was a blend of watermelon, mint and lemon- it was as refreshing as it sounds. Next was the star of the night – The Pizza !! The chef prepared their signature pizza from scratch; he explained to us every minute detail and walked us through the process of creating this Italian wonder. 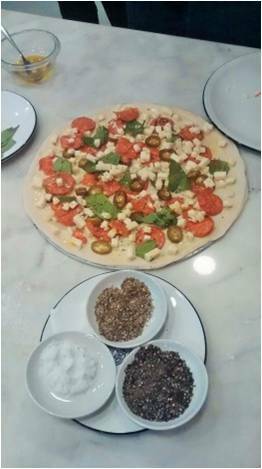 The importance of evenly stretching the dough, not overloading the pizza with the toppings so as to let the flavour of the base stand out, every tip and trick was shared. The fun was tripled when we got a chance to create our own pizza under the supervision of the chef. A thin and crispy Romana base, layered with their signature tomato passata sauce which is imported from Italy, topped with fresh basil, buffalo mozzarella, cherry tomatoes, flavoured with salt and black pepper and finally drizzled with olive oil was the highlight of the evening. The pizza was not at all heavy, the base maintained its crunch and one could have countless slices of it- a must try. For a perfect end to a meal, a baked vanilla cheesecake served with your choice of gelato, cream or mascarpone(a soft cheese) delighted the senses. A place that promises quality and will surely continue to maintain its legacy; if pizzas define Italian food for you, head to Pizza Express now and indulge!